Clean and protect dodger windows, ports, and clear hatches. Cleaning clear plastic windows, ports and hatches on boats can be a challenge. These plastics are prone to scratching and can be damaged by ammonia based cleaners. 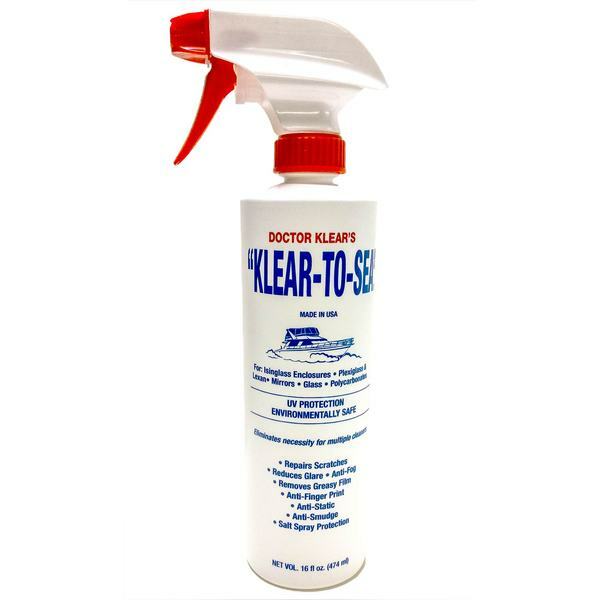 Klear-To-Sea is formulated specifically to clean, polish and preserve polycarbonates (Lexan®), acrylic (Plexiglass®), strataglass, vinyl, insinglass and other plastics commonly used for marine applications. Application can reduce glare and fogging and help to repel dust on clear plastics by reducing static. Polishing qualities of Klear-To-Sea may actually repair minor scratches with regular use. To clean and protect dodger windows, clear hatches and windows chose a cleaner specifically formulated for the task.